From about the late 1880s, just as Corbin & Nicolle were opening their arcade, the economy started to decline. This was a world-wide effect, made worse in Australia by a prolonged drought. There was a banking crisis in 1893 and the world economy went into depression, the deepest ever seen at the time, only ever exceeded by the Great Depression of the 1930s. Many businesses were wiped out. Amongst the casualties were James Corbin and Phillip Nicolle. be allowed to retain their respective households of furniture & effects and stock in trade and plant and also interest in lease in premises situate at No.86 Hunter Street Sydney. Keeping their business premises in Hunter St was vital to enable them to get back on their feet. 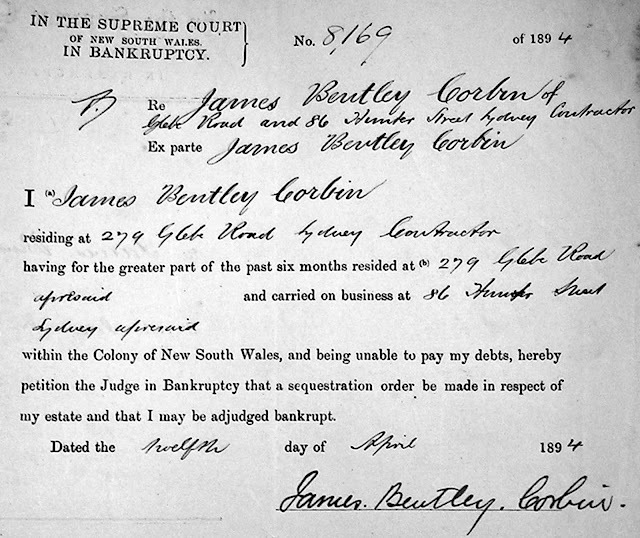 In his submission James had stated 'business estate not bankrupt' - he felt his building business was still viable. This is not hard to believe after viewing the statement of transactions they had to submit, detailing their business activities of the last two years. It shows building work for, amongst many others, Richardson & Wrench, David Jones & Co, Bank of Australasia, and the Hotel Metropole, and various institutions such as Sydney Hospital, Prisons Department, St James Church and the Australian Club. The type of work is not stated, it may not have included any more large constructions like the Victoria Arcade, but it shows that James, even during the depression, was a very busy man. But the ₤25,000 debt on the Victoria Arcade could not be serviced, so Corbin & Nicolle lost their share of their great project. James was probably also forced to surrender houses in Glebe and Paddington, property at Valley Heights, Auburn, Bankstown, Riverstone and Manly, and his development blocks in WA, the value of which had plummeted with the depression. Corbin & Nicolle were discharged from their bankruptcy in August 1894. Their partner in the arcade venture, the big merchant J.H.Goodlet also 'suffered severely' in the bank crash of 1893 but recovered and went on to take control of the Victoria Arcade. For James a slow financial recovery began, but his troubles were not over. On 30 June 1899, Margaret Mary Corbin collapsed and died of heart failure at their home 'Alresford', Glebe. James was called and 'he ran upstairs but it was too late, she was already dead'. Her 50th birthday had passed just 3 months earlier, but it appears there was no celebration then, perhaps she was coy about her age, because her death certificate states her age as 47. (Her 'In Memorium' card gives the age as 42 - probably a mistake by the printer.) She had been married to James for 31 years and had given birth to 9 children, with 8 surviving, Harry the eldest now 30 and Ernest the youngest now 13. 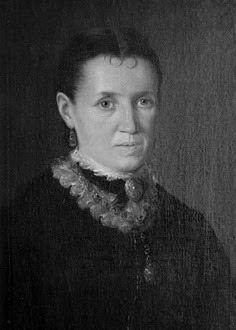 None of her children had married yet and she had no grandchildren at that stage. Another in this family story to die young. Although she did not live to see it, there were plenty of grandchildren, 27 in all. The first of her children to marry was Percy, just a few months after his mother's death. Eventually all but Albert were to marry and have kids. Thanks to Margaret, all of us who are decendants of James Bentley Corbin also have Clancy ancestry. We all share an Australian family heritage that stretches back to 1838, back to the pioneers of Concord, John & Mary Clancy. In 1903 came another death that would have shaken James - his business partner, and surely friend, Phillip Nicolle. They had been together in the cabinetmaking, carpentry and building business for 35 years. James was 59 years old when he lost his partner, and after that the business became simply 'J.B.Corbin, builder'. Despite his advancing years and the loss of his partner, James was still showing plenty of spirit. It seems he leased a couple of properties adjacent to his Hunter St premises, and he got a telephone connection and listed the number in the Sydney Directory when this was still uncommon. In 1905 James took out a gold mining lease, in partnership with others, at Araluen in southern NSW - it's not known if he had any luck, but a photo taken of him with a tent in the background, the only certain image we have of James, is said to have been taken at Araluen. T.W.Corbin's life has some parallels with that of James - they were just one year different in age, they both came out to Australia in their youth, established lasting Corbin dynasties in their chosen cities, and they died in the same year. James' eldest, Harry, was a complete unknown to all the other branches of the Corbins until very recently. He seems to have become estranged from his parents and siblings, and no-one ever seemed to know what became of him. One wonders if his father knew that Harry got married in 1901, had a child in 1904 and died in 1908. CORBIN - March 17, 1918, at his son's residence, Rosemont, Bream St, Coogee; James Bentley Corbin, late builder and contractor of Hunter St, Sydney. He is buried in Randwick Cemetery, the family being either unable or uninterested in burying him with his wife out at Rookwood. For years there was no headstone to mark the grave but this was rectified by some of his grandchildren. He left no will, and it is assumed when he died he had few assets. At the time of his death James had 23 grandchildren. When his 24th came along, the first grandchild to be born after his death, James was not forgotten - Herbert and his family were living at 363 Glebe Point Rd at the time, and Herbert named his new son Geoffrey Alresford Corbin. Can we sum up our ancestor James Bentley Corbin? He was a builder. He built a notable part of our great city of Sydney - the Victoria Arcade - and he built a lasting legacy for his adopted homeland - ourselves, the Corbin family.